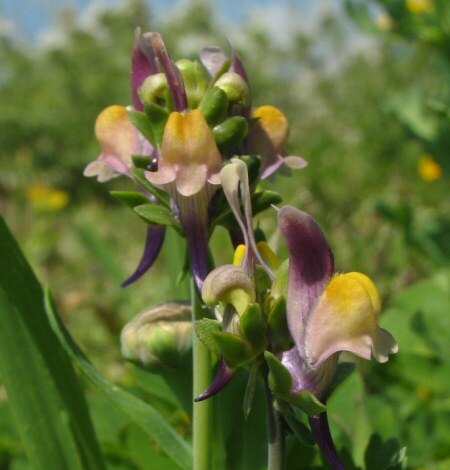 ﻿ Linaria triphylla (Three-coloured Toadflax) : MaltaWildPlants.com - the online Flora of the Maltese Islands. Glabrous, somewhat glaucous annual; stems 10-45(-65) cm, usually single, erect, simple or branched above, stout. Leaves 15-35 × 10-25 mm, elliptical or obovate, truncate or semiamplexicaul at base, mostly verticillate but some opposite or alternate. Racemes rather dense, greatly elongating in fruit; flowers subsessile. Calyx 9-12 mm; lobes ovate to lanceolate, obtuse to acute, unequal. Corolla 20-30 mm, white (rarely pale yellow or violet) with orange palate and violet spur; spur 8-11 mm. Capsule c. 8 mm. Seeds c. 1•5 mm, tetrahedral, strongly ruminate-alveolate, greyish-brown, with acute angles.